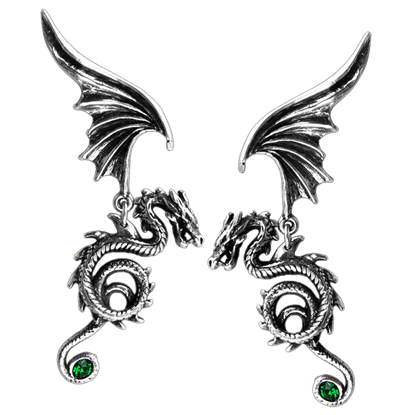 We carry some of the finest gothic earrings around in both single earring and earring set options. These gothic earrings for men and women are the perfect dark accessory for accenting your look, available in a variety of designs like stud earrings, dangle earrings, hoop earrings, and wrap earrings. Our gothic post earrings include designs like playing card suits, skulls, bats, roses, spiders, hearts, and more, while our gothic drop earrings expand the selection to include crosses, ankhs, blood drops, fallen angels, and skeletons. 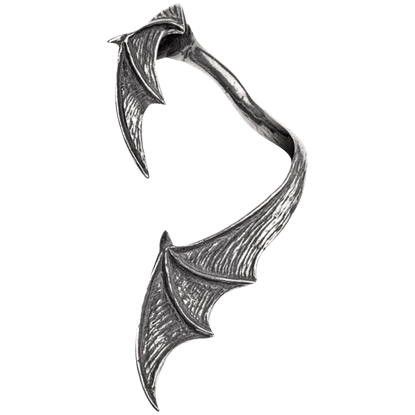 Our gothic single earrings, faux ear stretchers, and ear wraps come in designs to fit the left and right ears, showing off daggers, serpents, razors, stars, scorpions, scythes, and other wicked icons. 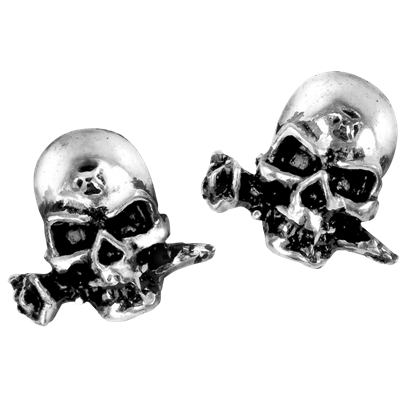 Our goth earrings are very affordable, making them excellent gifts or personal accessories. The Egyptian god of life, death, resurrections, and the afterlife, Osiris bequeaths the Breath of Life to those blessed with immortality. 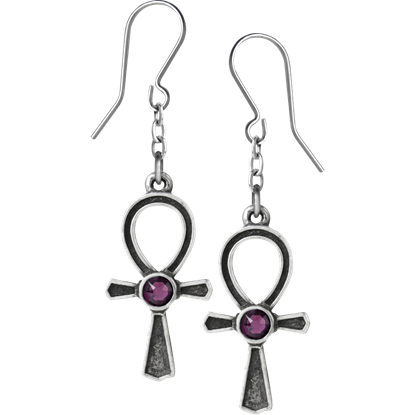 The Ankh of Osiris Drop Earrings feature the iconic cross symbol on a short chain. 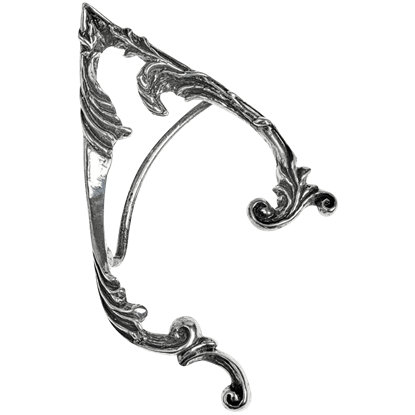 An elf ear, recreated in polished, antiqued pewter. This fey jewelry displays a Victorian gothic fantasy of swirling, verdant flourishes. The Arboreus Earwraps are perfect for Faerie festivals, LARP events, or fantasy conventions. Roosting vampire bats hang silent and motionless deep within their cave, anticipating the subtle arrival of dusk as the last vestiges of light leave the sky. 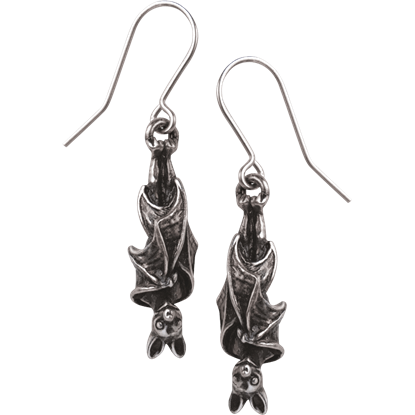 The Awaiting the Eventide Drop Earrings suspend a pair of upside-down bats. These sumptuous earrings hint at a secret libertine passion for wine and other pleasures with their romantic motif. 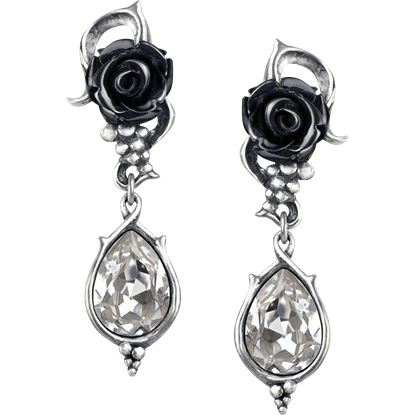 The Bacchanal Rose Earrings display a single black acrylic rose at the main point of the design on each earring. 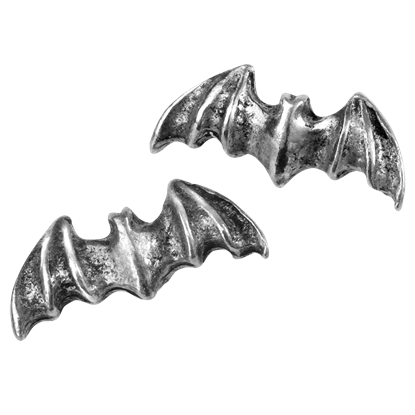 The Batstuds Earring are a subtle accent that allows any nocturnal predator to show off their style. 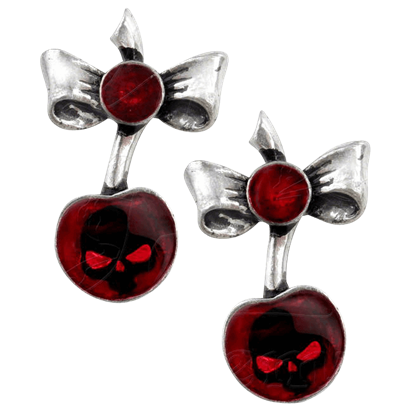 Even if you are human and not vampire, these earrings are a great way to add some vampiric style to your gothic look. A bleeding heart often becomes a broken one. The bleeding heart and the black rose, symbolic of dark love, go well together. 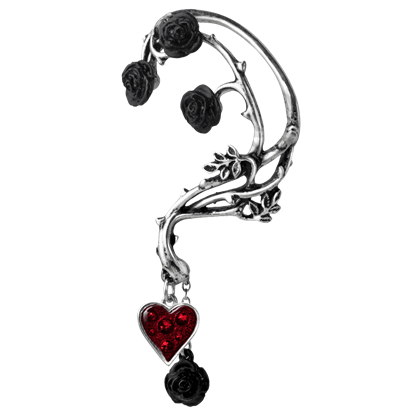 Never before have they been as perfectly paired as they are in this Bed of Blood Roses Single Ear Wrap. At the center of these medieval cross charms, the face of a skull emerges as if from a black abyss. 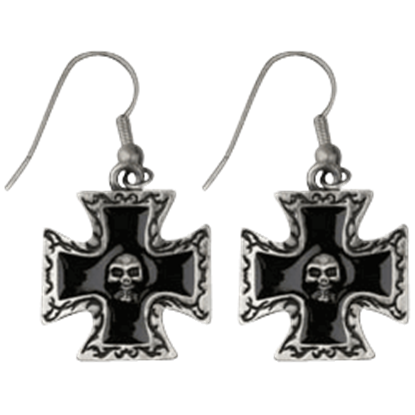 Bring a touch of darkness to everyday outfits with the stylish and versatile Black Cross Skull Earrings, made of lead free pewter. Odin was never far from his two ravens. Now you can emulate that practice by having two ravens of your own. 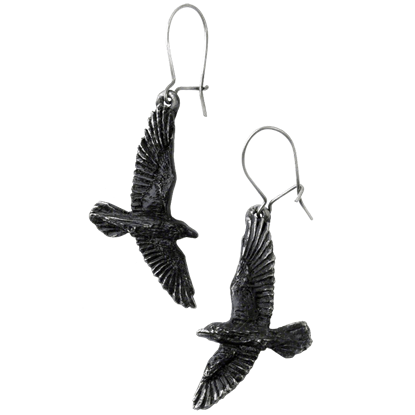 Soaring just beneath your ears, these Black Raven Earrings are a perfect way to say something distinctive about your style.